New Bedford, MA – PowerDocks, LLC announced today the successful demonstration of its Blue Isles™ Floating Microgrid Mooring Platform in partnership with the New Bedford Ocean Cluster, ImpactLABS and the Port of New Bedford Harbor Development Commission (HDC). This platform is the first of its kind, showcasing the ability to provide: electric power for vessels, primary/auxiliary/backup power for the city, multiple wireless networks, sustainable energy for the city in case of a natural disaster, electrical power for vessels moored off its platform, real-time remote monitoring of the harbor’s environmental conditions and remote video surveillance monitoring. When several platforms (among the port’s 300 moorings) are combined, over 1 MWh of stored energy can be offered to the City of New Bedford during a power outage or natural disaster. 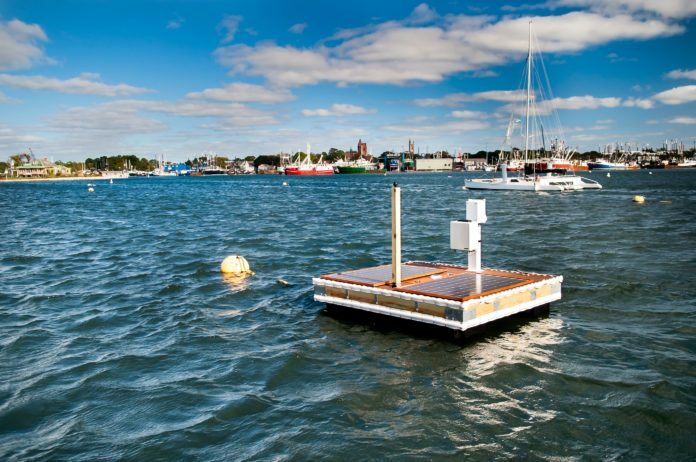 PowerDocks, LLC (www.power-docks.com) develops Marine Autonomous Powered Docking Platforms (MAPDs) that are capable of delivering onsite critical power and enhanced operational capabilities to a broad range of customer applications, including: Yachting, Defense, Oceanographic, Aquaculture and Offshore Commercial industries worldwide. ImpactLABS (www.iotimpactlabs.com) helps small and mid-sized businesses (SMBs) instrument the physical world with intelligence and intention for profit and resilience. We pursue this mission through a multi-stakeholder model that brings together: SMBs, physical world subject matter experts (SMEs), early stage Internet of Things (IoT) companies and visionary Fortune 5000 technology and industrial businesses. For more information on PowerDocks, please contact Anthony Baro at abaro@power-dock.com or call 401-489-2273. For more information on Impact LABS, please contact Chris Rezendes at cjr@iotimpactlabs.com or call 508-415-5022. For more information on the City of New Bedford HDC, please contact Edward Anthes-Washburn at Edward.Anthes-Washburn@newbedford-ma.gov or call 508-961-3000.